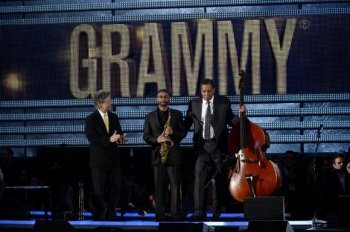 In a stunning tribute to jazz pianist and legend Dave Brubeck, three accomplished jazz musicians paid tribute to Dave Brubeck at the 2013 Grammy Awards. The following is an excerpt from the jazz website All About Jazz (copyright) . For many years Jazz, Classical and other musical genres outside of Pop have been delegated to the Grammy Pre-Show, which has only been available as an online broadcast since the advent of video streaming. Clarke is pleased Grammy producers changed it up a bit this year. The bonus of the evening was being able to acknowledge and pay tribute to the legendary Brubeck. Ironically Clarke, Corea and Garrett are all Grammy Award winners in jazz categories, but though nominated four times, Brubeck never won a Grammy. He was honored, however, with a Grammy Lifetime Achievement Award in 1996. It is apt that Clarke, Corea and Garrett were asked to perform. All are innovators in the jazz genre and have reached legendary status in their own right. Brubeck, whose career spanned over six decades, was a trendsetter in the progressive jazz movement. He is known for his odd time signatures, improvised counter points and other experimentation that remain hallmarks of innovation. Brubeck passed away in December of last year, one day before his 92nd birthday. His legacy lives on as he continues to be one of the most popular musicians in both the jazz and classical worlds. Clarke performed once with Brubeck when he was just starting his career. He remembers it well and recollects, “When I was 18, Dave or someone from his management, hired me to sub for his bassist, who couldn't make this gig in some club in Jersey. I was scared to death having to read all his charts! I saw him at a festival we were on together a couple of years ago and we laughed about that gig. It was so cool to play with Joe Morello and Paul Desmond of the Dave Brubeck Quartet. That experience certainly had an impact on me, especially being so young and green."